When was the last time you tested your RCD? If a safe electrical environment is important to you, then you probably have a RCD installed in your Consumer Unit. An RCD is, put simply, a device that protects you against the risks of electrocution and fire caused by earth faults. It provides protection that normal circuit breakers cannot provide. If you want to know more about what an RCD is and how it keeps you and your family safe, then check this link out. If you have an RCD installed in your house and your grounding is done properly, then great! But did you notice that your RCD has a TEST button? Here is an example of a RCD installed in a Consumer unit. Can you see the little test button? To ensure that the RCDs fitted to your property perform correctly, they must be tested at regular intervals. Pressing the test button will simulate an earth leakage fault and indicates whether the device is operating correctly. When an RCD operates all power is lost to the equipment, power point or circuit protected by the RCD. To restore power just move the “on/off” switch back to the “on” position. Electrical clocks and timing devices may have to be reset. This test procedure is simple and should be done at least 2-3 times a year. This way make sure that your RCD is still protecting you and it will keep the mechanical parts inside the RCD in good shape. 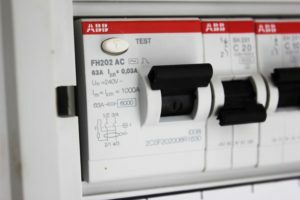 If the RCD fails to operate, a licensed electrical contractor must be engaged to test the RCD and replace it if necessary. Posted in Kat-Tech electrical school.